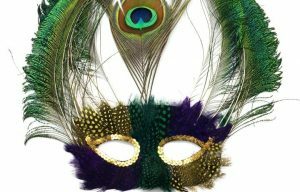 Mardi Gras Day is quite a day and this year it is on February 28, 2017. It is filled with lots and lots of parades from Zulu and Rex to Metairie Truck Parades, but have you ever heard of the Society of Saint Anne Marching Parade? We may be giving away one of the local’s secrets, but this is a local favorite. On Fat Tuesday, aka Mardi Gras Day, the society of Saint Anne marches through the streets of New Orleans. This marching parade was founded in 1969 and usually starts at Bud Rips in the Bywater at Piety and Burgundy streets around 10:00am. This Krewe is famous for the elaborate costumes and of course the Storyville Stompers Brass Band music. The group will begin in the Bywater neighborhood and wind its way through the Faubourg Marigny and French Quarter continuing to Canal Street to watch the Rex Parade and then return into the French Quarter. What is unique about the Society of Saint Anne Parade is that it grows as they continue walking. As the group makes its way through the neighborhoods, at each corner, more people will join in the parade fun some are members and others just want to be a part of the fun parade.